Dinosaurs are fascinating for many children and can be an excellent unit study for the beginning of the school/homeschool year. You can emphasize science, history, or any other subject, and it’s easy to find hands-on dinosaur materials. Of course, you can include dinosaurs as part of a systematic study of animals starting with living/non-living; then plant/animal; animals and their groups; vertebrate/invertebrate; types of vertebrate/types of invertebrate, etc. Montessori at Home shows an example of Montessori zoology classification. You could introduce dinosaurs when you study reptiles. Or you could introduce dinosaurs with a series of living/non-living/once-living activities like the unit at Kingdom of the Pink Princesses. Young children often enjoy an emphasis on digging for fossils and paleontology terminology as well. You can introduce a dinosaur unit now or any time during the school year, adding activities according to your child’s interests and developmental needs. 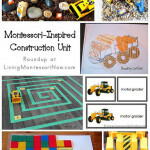 Here are some great Montessori-inspired resources that can be used for multi-age learning. 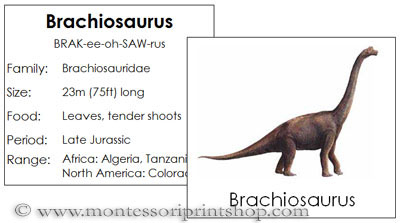 Montessori Print Shop has free and inexpensive dinosaur cards. Jojoebi has free black and white 3-part dinosaur cards and dinosaur info cards. 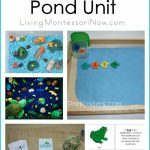 There are links to many printables that can be used for Montessori-inspired dinosaur activities in my post at PreK + K Sharing: Montessori-Inspired Dinosaur Fun with Printables, Water Beads, and Glass Gems. Family FECS has a dinosaur “excavation” site using dinosaur figurines (photo at top of post). 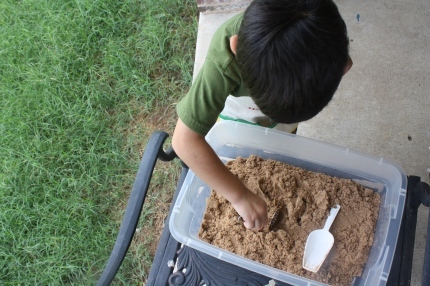 Montessori MOMents has a paleontology dig. 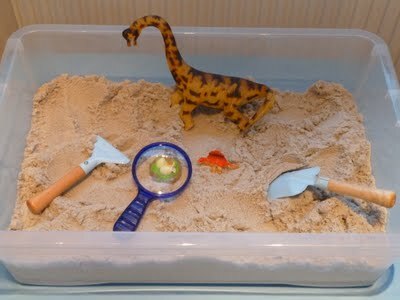 Nurturing the Tender Years has dinosaur digging (for dinosaur skeletons), greater than-less than dinosaur worksheet printable, and dinosaur writing practice. Caminen Plegats has fossil footprint activities (use the Google translator in the right sidebar). 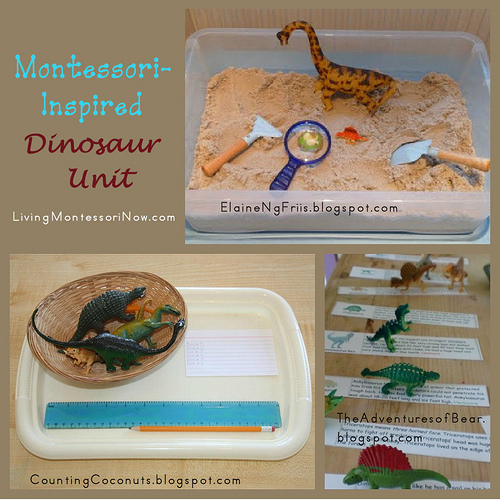 Counting Coconuts has a dinosaur unit with lots of activities. Maybe Montessori has dinosaur clips for color matching and eye-hand coordination. The Adventures of Bear has a dinosaur unit. 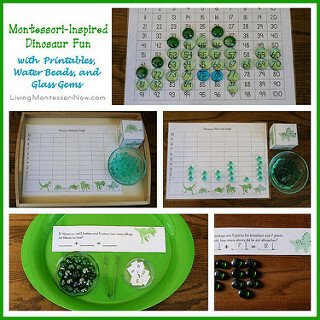 I have a post at PreK + K Sharing with Montessori-Inspired dinosaur fun with printables, water beads, and glass gems. 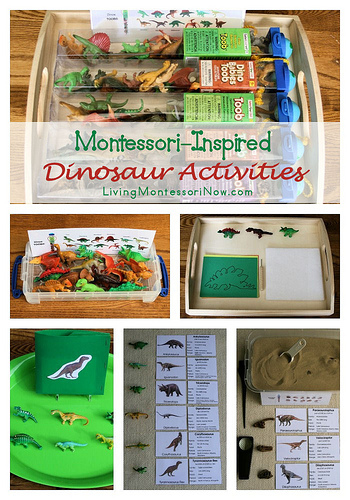 Montessori Mama has dinosaur color sorting and other dinosaur activities. Oh! 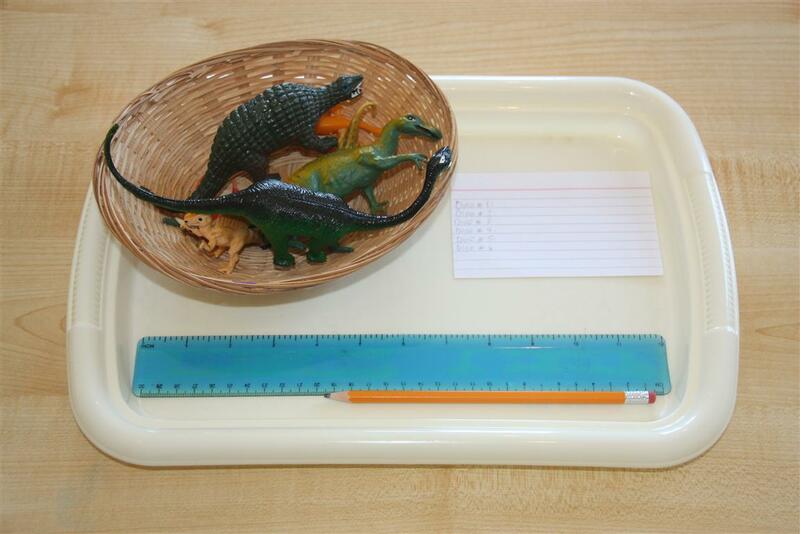 The Things You’ll Know … has a number of creative dinosaur activity trays. My Little Princess World has lots of Montessori-inspired dinosaur activities. 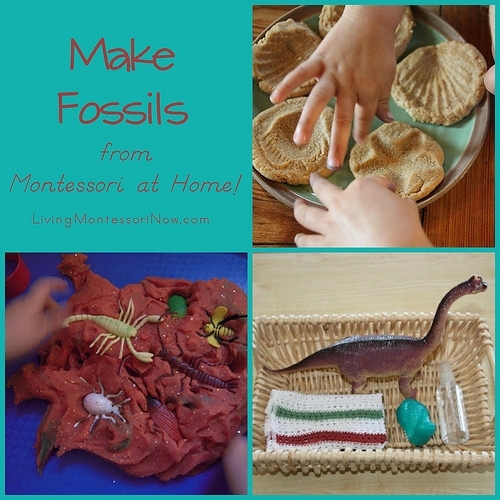 I have a post called Make Fossils from Montessori at Home! 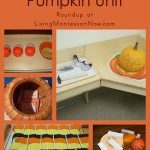 with activities from an excerpt of John Bowman’s Montessori at Home eBook. 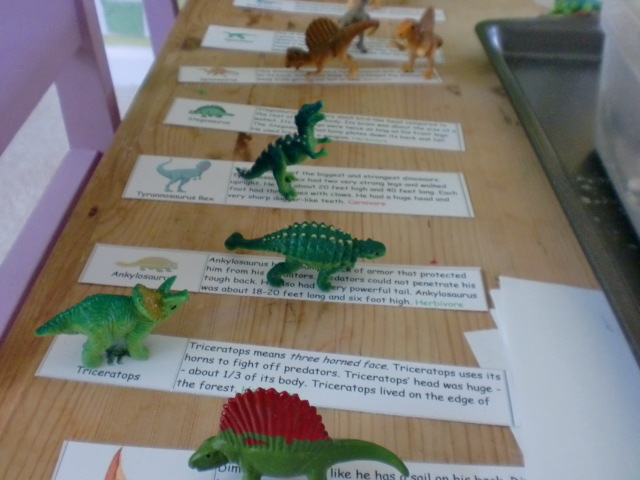 I have a post with Montessori-Inspired Dinosaur Activities Using Replicas. 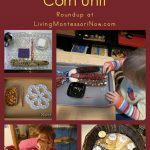 I share a number of Montessori-inspired activities created using Safari Ltd. Dinosaur TOOBS and Montessori Print Shop materials. I have a post with Free Dinosaur Printables and Montessori-Inspired Dinosaur Math Activities (plus a related post at PreK + K Sharing). 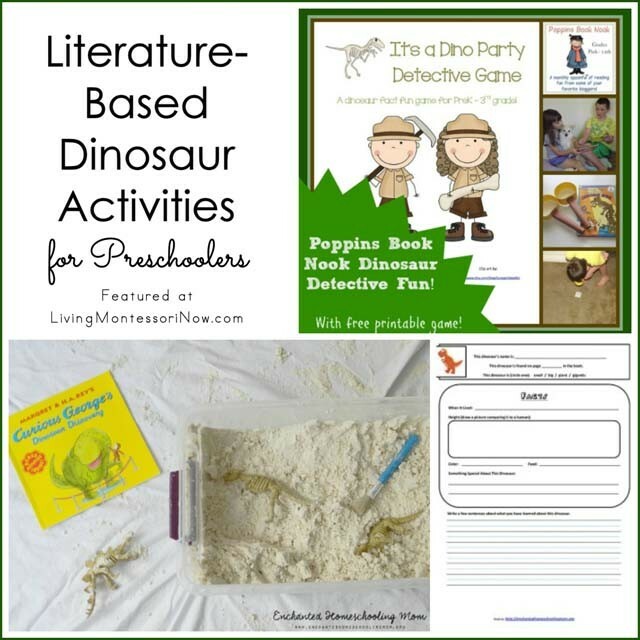 I have a post with Literature-Based Dinosaur Activities for Preschoolers. I have a post with a fun dinosaur science experiment. The Pinay Homeschooler has dinosaur posts with lots of creative activities. The Arrowood Zoo has a dinosaur unit. 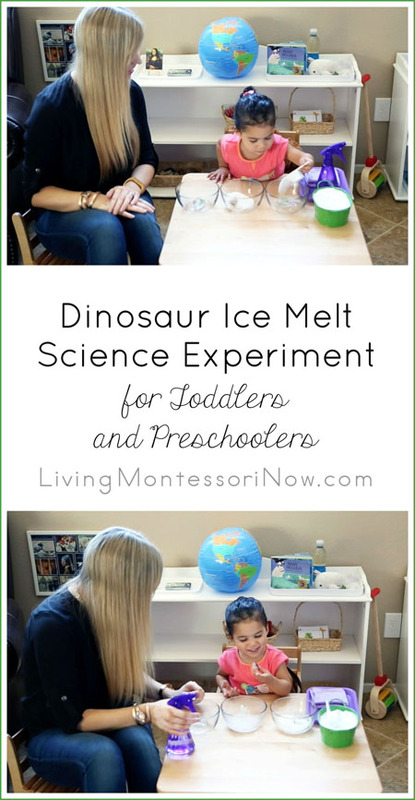 There are lots of links to dinosaur resources at Montessori Mom. For elementary-aged kids, you could focus on the Great Lessons “God Who Has No Hands” and “Coming of Life” as well as the Clock of Eras and Timeline of Life. Moteaco has information on God Who Has No Hands, Coming of Life, and Timeline of Life. 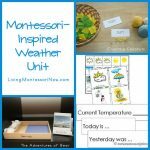 Miss Barbara has pages with many helpful links: The Montessori Great Lesson Page and Web Page Sites for Montessori Students. Wikisori has information on the Clock of Eras and the Timeline of Life. Fossils-Facts-and-Finds.com has free materials for the Clock of Eras and the Timeline of Life. Montessori Research and Development has teacher manuals you can purchase with detailed information on Montessori elementary history. North American Montessori Center has a free Clock of Eras (history sample) and Montessori elementary manuals available for purchase. 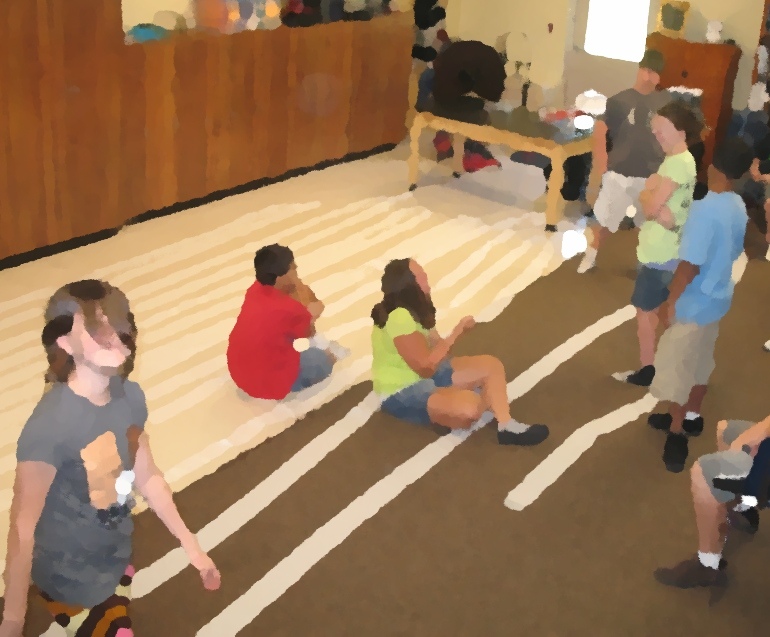 Montessori Muddle has the Toilet Paper Timeline of Earth History along with lots of dinosaur information for middle and high school. Follow Deb @ Living Montessori Now’s board Dinosaur Unit Study on Pinterest.On Pinterest, I have more resources for a dinosaur unit study for many age levels. 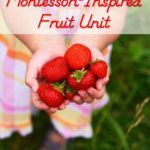 The resources aren’t all Montessori resources, but there are many wonderful ideas to choose from to fit into a dinosaur unit. This is a great activity. My daughter’s have sensory boxes that they love, so this activity would be taking it to the next level. Thank you for sharing. This post is so timely for us as our son, who went through a several year dinosaur obsession and then, one day, decided he did not like them anymore, has just as capriciously, decided he is fascinated with them again. In fact, he just spent hours in the tubby playing with figurines. So, you can bet I will be checking out your links. Thanks! As a sorting activity, offer your child an assortment of dinosaur figurines and sandpaper numbers for 2 and 4. after tracing the numbers with fingers, have your child sort the biped and quadraped dinos onto the appropriate number. We also did some phonics work using the same concept. 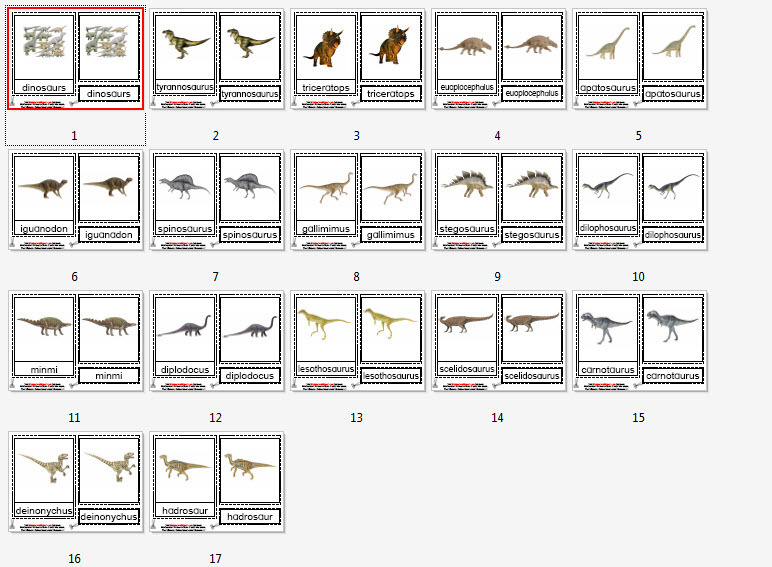 I took out all the sandpaper letters that had sounds which the dino figurine names started with. Luke sorted the figurines onto the appropriate starting letters. i’m a new gfc follower, facebook liker, networked blog follower…i just clicked on everything on your sidebar basically:) hope you’ll stop by my site and follow back!! 🙂 thanks! Every time I read your posts I think how thorough and resourceful you are! Thanks so much for sharing what is a wealth of information. Both my daughters LOVE dinosaurs and these will be very helpful for us! My niece can literally tell you every dinosaur that was ever discovered! Remember growing up and there was like 10- maybe? Great post and very educational! As always thank you so much for linking up to The Sunday Showcase! Fantastic collection of links and ideas, as always! Love your ability to find the best! 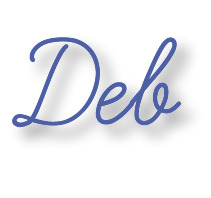 Thanks Deb for adding us to your amazing collection of ideas.! Love this! More fun things i can do with my Dinosaur pack! These dinosaurs look like so much fun and a great educational tool for children and their teachers and of course, parents too! This could be a fun article to use as a compliment to a Dinosaur Unit. It investigates whether or not Jurassic Park could happen in real life! We are going to start a dinosaur theme soon and you have collected a wonderful variety of activities that I am sure I can pull from. Thank you!